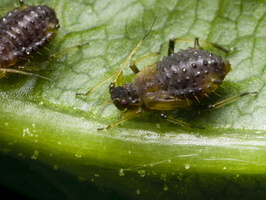 EN · Aphids | DE · Blattläuse | LV · Laputis | PL · Mszyce | RU · Тли Suborder: Sternorrhyncha Infraorder: Aphidomorpha Most aphids have a pair of cornicles ("siphunculi"), abdominal tubes through which they exude droplets of a quick-hardening defensive fluid. 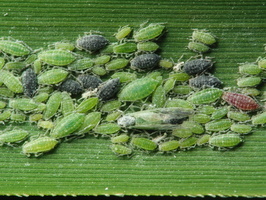 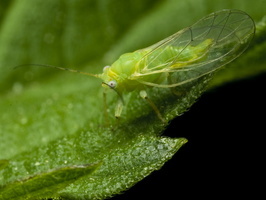 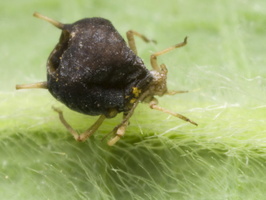 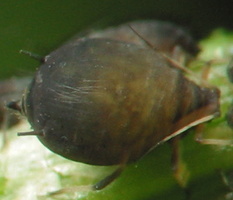 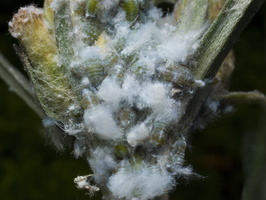 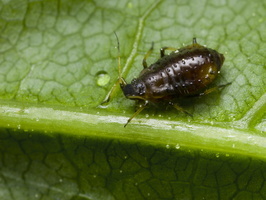 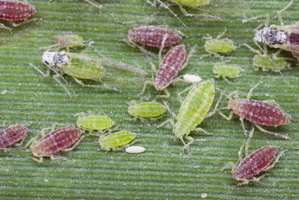 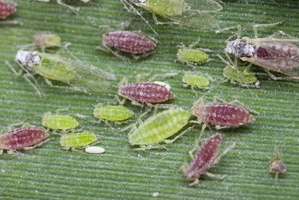 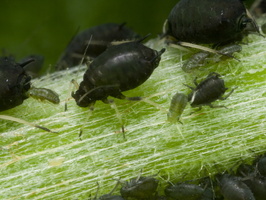 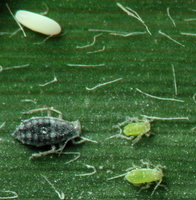 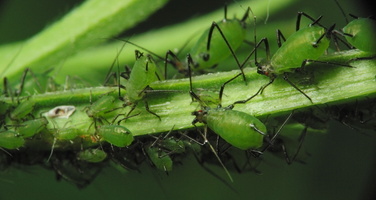 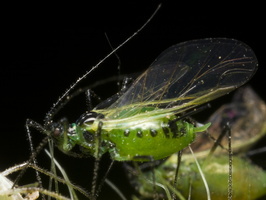 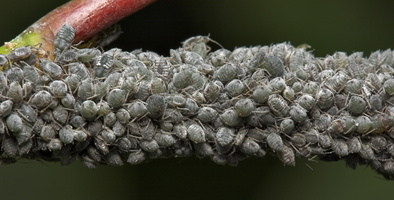 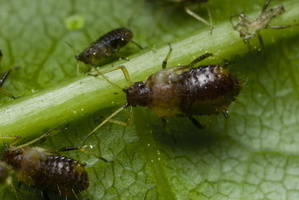 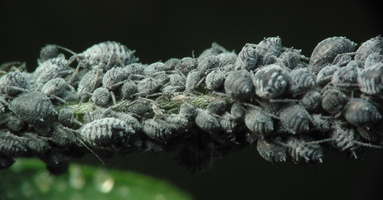 Aphids have antennas with as many as six segments. 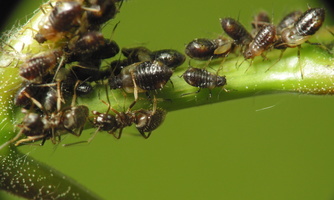 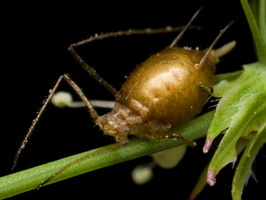 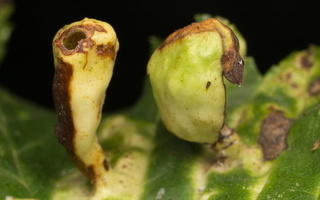 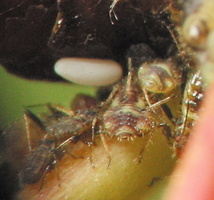 Aphids feed themselves through sucking mouthparts called stylets, enclosed in a sheath called a rostrum, which is formed from modifications of the mandible and maxilla. 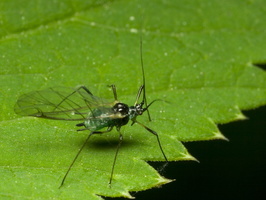 They have long, thin legs and two-jointed, two-clawed tarsi. 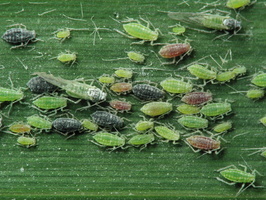 Plants contain low densities of the nitrogen compounds needed for building proteins. 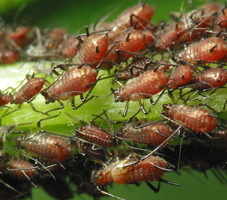 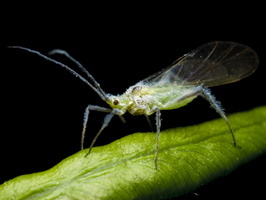 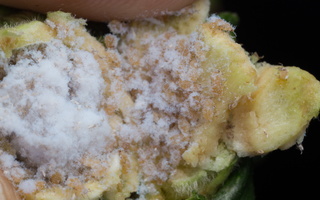 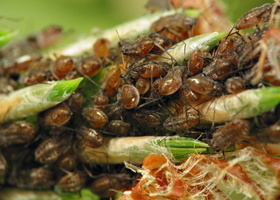 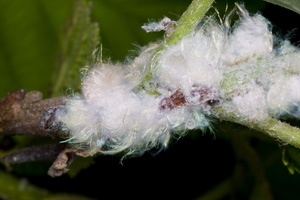 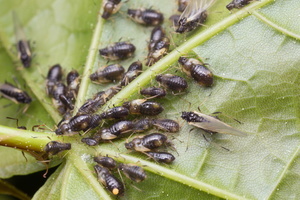 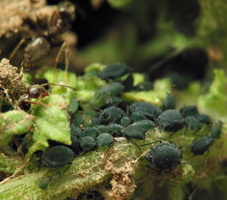 This requires aphids to consume an excess of sap to satisfy their nutritional requirements. 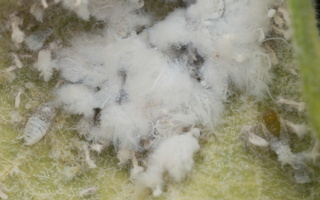 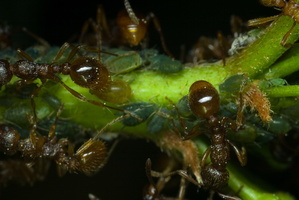 The excess is expelled as "honeydew", out of the recta of aphids, in such large volumes that in sometimes it can "fall like rain". 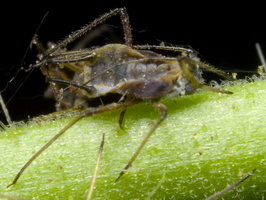 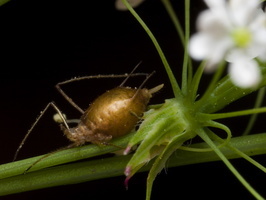 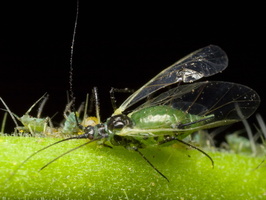 Aphid honeydew is rich in carbohydrates, like the phloem it derives from. 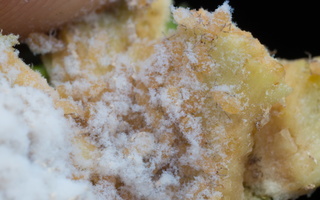 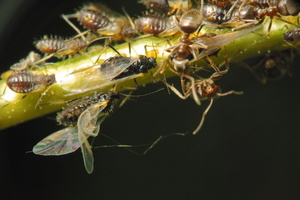 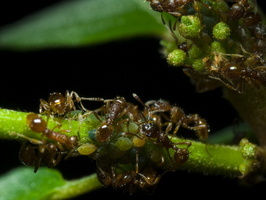 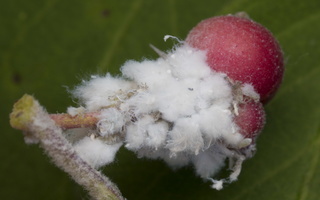 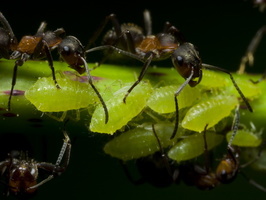 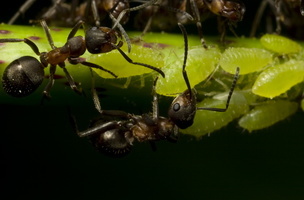 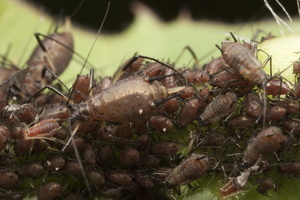 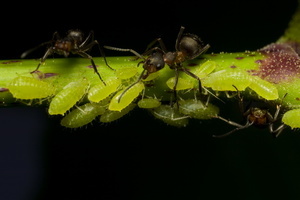 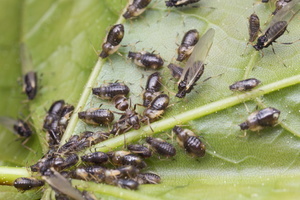 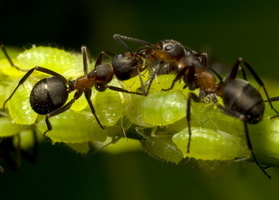 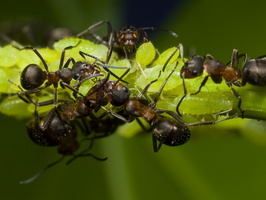 Some species of ants "farm" aphids, protecting them on the plants they eat, and eating the honeydew that the aphids release from the terminations of their alimentary canals.